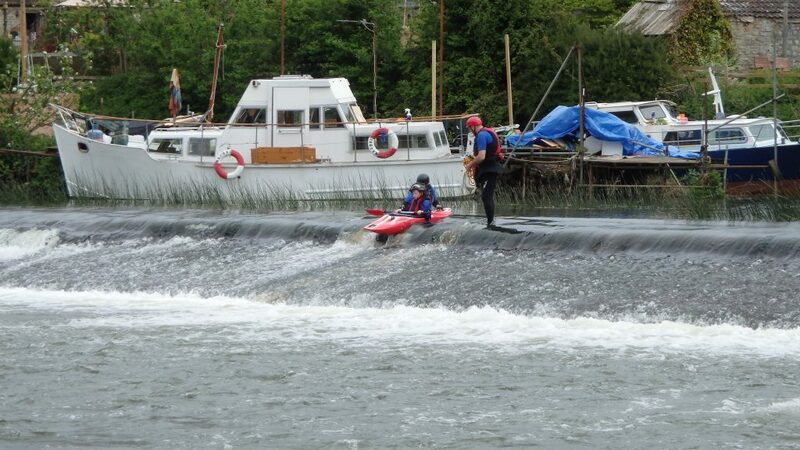 On Saturday 12th May we took 16 of the Club’s junior members age from 9 to 16 to Saltford. After an early start at the boatshed, we gathered the boats and equipment then loaded the club trailer and a few car roofs. It took quite a while to get 16 children and 5 adults on the water, so well done to everyone for their patience. We paddled up to the weir near The Riverside Inn and played in the flow of the water. After a few games (and a capsize), we got off the water and sat on the grass eating our lunch. After lunch we got back on the water and paddled for about twenty minutes to play on the chute and weir by Kelston Lock. Obviously for safety reasons some of the adults had to go down first to do a safety check. We spent the afternoon playing on the weir and the chute, then climbing out of our boats, climbing up the weir and going down again. This was the Club’s second junior paddling trip and was a huge success. Thanks go to all the parents who allowed their children to come and to the adults who helped us with lifts there and back. The biggest thank you is from me and goes to the children for their impeccable behaviour, and the following for their assistance on and off the water – Steve Holland, Julian Hellings, Martin Aspinall, Kate Uzzell and Sandie Beeson. These events take a lot of organising and are not possible without the right support! This is what some of the children had to say about their day out……. •It was very exciting. It was my first time in white water and now I’m hooked. I loved every minute! •It was great fun. Definitely the best white water I’ve experienced. When can we go again? •Thank you and the rest of the helpers who organised the kayak trip that I had lots of fun at. The whole day was brilliant, especially going down the weir. That was my favourite bit because it was very fast. Going up the weir was fun as well. •At the beginning of May, on a sunny Saturday, we went on the most amazing trip as part of the Paddle Power Course run by Clevedon Canoe Club. 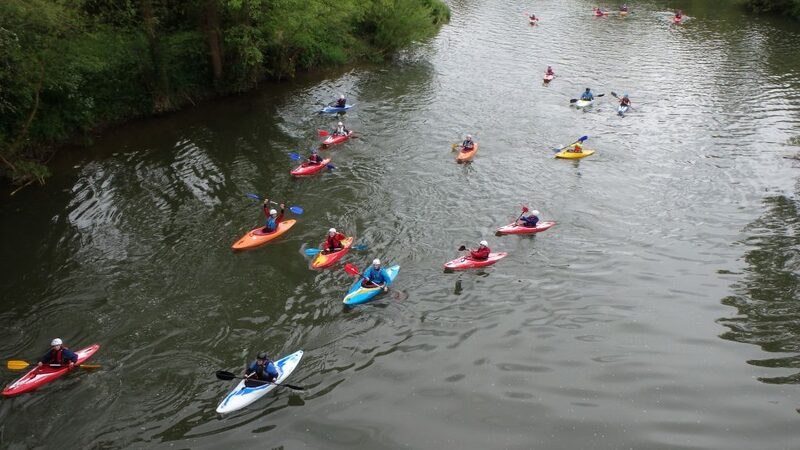 We paddled down the weir in Saltford and played games like water polo and ‘catch’ in the kayaks: this enabled us to gain more confidence on the water. When we capsized, our instructors were there to help us. We had so much fun we cannot wait to do it again. Learning so much, the course taught more safety with the spray decks and how to capsize properly. We both couldn’t thank the instructors at Clevedon Canoeing Club enough for their time, commitment and enthusiasm and we loved it!